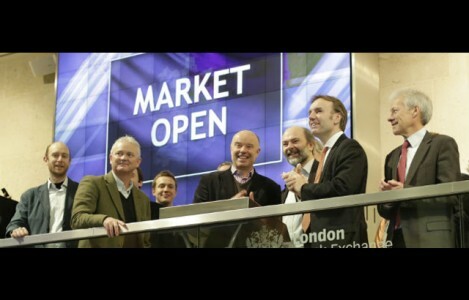 Actual Experience plc (AE), whose origins lie in 10 years of research at EECS, opened the market at the London Stock exchange on Thursday 13 February, valued at £15.5m. The company has developed innovative technology that evaluates whether the IT services used by businesses are enabling or hindering their staff and customers. High profile clients include broadcasting regulator Ofcom, ITV, Accenture, Verizon and Deutsche Post. AE’s top ten customers have approximately one million employees in total, and over $300 billion of annual revenues. AE’s Analytics-as-Service product takes measurements across global Digital Supply-Chains – gathering information specific to the locations and applications used by AE’s customers. Measurements are then passed to the company’s Analytics Engine – the result of more than 10 years of academic research at Queen Mary, and of AE’s intellectual property in both computational algorithms and measurement systems. Measurements are transformed into meaningful business information, enabling clients to understand whether their customers are being helped or hindered by IT, how they can improve experience, and how to manage cost without reducing experience. Actual Experience was co-founded in 2009 by Jonathan Pitts, Professor of Communication Engineering at Queen Mary, with business partner Dave Page. Key investors include FTSE 250-listed intellectual property specialist IP Group, and Henderson Global Investors who led AE’s most recent funding round in 2013. QMI, the technology transfer arm of Queen Mary, worked closely with Actual Experience to develop a business plan and raise its first financing. Adam Daykin, QMI’s Head of Technology Transfer responsible for Technology and Engineering, comments: “We are delighted that another QMI company has made the successful transition to listing on the London stock market. In November 2013 Actual Experience achieved a double success, completing a £4.07m financing round with one of Europe’s largest investment managers, Henderson Global Investors, and winning the prestigious Innovation and Entrepreneurship category in the 2013 UK IT Industry awards.